Liquid cooling does not have to be flashy and full with RGB. It does not need to have a heavily modded case. In fact, you don’t even need to have custom sleeved cables. 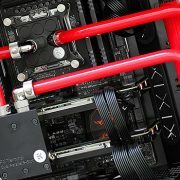 Sometimes, liquid cooling is used for regular power-packed PCs, simply because it offers the best performance. Also, you get to have a very cool looking silent PC. This build is brought to us by Nenad “neSSa” Đorđević, the host of SS PC Modding.